Savin had worked on his vessel for months in the small shipyard of Ares on France’s southwest coast. Savin is 71-year-old and from France. 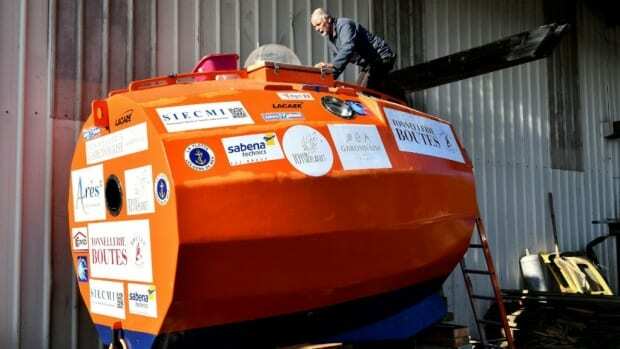 He set to sail across the Atlantic on Wednesday in a barrel-shaped orange capsule. His destination is the Caribbean wanting to reach there within 3 months and his only power will be the ocean current. “I’ve got a swell of one meter and I’m moving at two or three kilometers an hour,” Jean-Jacques Savin told AFP news agency by telephone after setting off from El Hierro in Spain’s Canary Islands. Gavin had worked on his vessel for months in the small shipyard of Ares on France’s southwest coast. Measuring three meters (10 feet) long and 2.10 meters across, it is made from resin-coated plywood, heavily reinforced to resist waves and potential attacks by orca whales. Inside the capsule, which weighs 450 kilograms (990 pounds) when empty, is a six-square-meter living space which includes a kitchen, sleeping bunk and storage. A porthole in the floor lets him search for fish. He has stowed away a block of foie gras and a bottle of Sauternes white wine for New Year’s Eve, along with a bottle of red Saint-Emilion for his 72nd birthday on January 14. Savin hopes currents will carry him naturally to Martinique or Guadalupe. Even the wine onboard will be studied: He is carrying a Bordeaux to be compared afterward with one kept on land to determine the effects of months spent tossed on the waves. Savin has 60,000 euros (US$68,000) for his expedition.